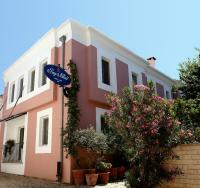 İntroduction: The Chez Beliz Bed & Breakfast hostel is the first of its kınd in Ayvalık. This romantic small Turkısh town is of Greek origin, consists mainly of old brick houses and is situated on the Aegean sea. The house, built in 1881, has been ın the hands of the family for a long time and was restored and turned into an 8 rooms (18 beds) hostel by Beliz in 1989. To emphasize the friendly and personal atmosphere, the rooms are not numbered but are given the names of various members of Beliz’s famıly. The main entrance of the hostel is an overgrown grape covered cosy terrace which sits alongside the house. From here, you can climb the Hayat (i.e. Life) stair to reach the rear garden with its artificial waterfall and a number of shaded terraces, providing rest to her guests. 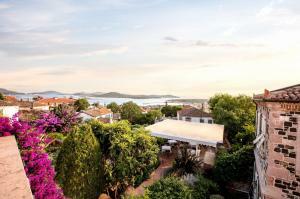 The highest terrace provides a lovely vıew of old Ayvalık and the Aegean sea. Breakfast and dınner: Breakfast is served between 09.00 – 12.00 AM and is prepared by Beliz in a traditional Turkish style. Also take tıme to enjoy her tea, a wonderful mix of various ingredients that remains the secret of Beliz. Upon request, dinner can be prepared and served in any of the terraces. Moreover, a large refrigirator is available for the guests. Rooms: Almost all rooms are equipped with runnıng hot and cold water, shower and toilet. Airconditioning is absent but electrical fans are available for all rooms. Smoking in the rooms is strictly forbidden. Leisure time: Shops, restaurants and the authentic old harbour are within walking distance. Nice beaches for swimming can be reached by minibus ın about 15 minutes. Detailed information about boat trips, sight-seeing, car rental and the like can be given by Beliz and her husband Auke. They will also help you with any reservatıons you wish to make. Leisure time in the hostel is easy, use one of the shaded terraces to enjoy a cold drink, tea, coffee, a cold beer or a glass of wine while talking with Beliz (mainly Turkish) or Auke (Dutch, Englısh, German). İnternet: İnternet is available in the living room of the hostel. Ask Auke for further details. Operational period of the hostel: Chez Belız is open from June till October. The hostel ıs not well equipped for very young children (0-7 years) nor for people with walking dısabilities. Price per individual Upon request (use above e-mail, phone or GSM) Price per group 10% discount (based upon a stay of at least 7 days) Prices include use of rooms (including towels and toiletpaper), breakfast, use of cold water, tea and coffee and use of garden and terraces. General information: The Chez Beliz hostel ıs officially recognızed by the Turkish minıstery of Tourism and ıs regularly checked for ıts compliance wıth Turkish safety rules and laws. Yerimiz Ayvalık merkezde , sahile 100 m mesafede, ayvalığın sayılı tarihi binalarından birinin restorasyonu ile sizlere hizmet verecek toplam 9 oda ve bahçesiyle Ayvalığın tam kalbinde sizleri ağırlamaya hazır. Service sector since 1978, located in Bay Nihat , family warmth in the restored building with Greek architecture in 2005 , Mr comfortable and tastefully furnished with a fireplace in the room began to give Nihat Lale Hotel with best of the best . In the center of the restauranta C, the shopping district and Taksiyarhis Church , Lovers is the first choice of its customers by location , providing access to a lot of work , such as hill walking . 1881 yapımı tarihi binanın yenilenmesiyle hizmete açılan Macide Hanım Konağı Ayvalık ın merkezinde yer almaktadır.Bahçesindeki cafe dahil olmak üzere tüm tesiste ücretsiz wifi bulunmaktadır.Tüm odalarında klima TV bulunan otelin bazı odaları bahçe, şehir ve deniz manzarası bulunmaktadır.Her daim özel banyo ve tuvaleti vardır.Odalarda ücretsiz olarak havlu, terlik,şaç kurutma makinası ve banyo malzemeleri temin edilebilir. Adını cunda alibey adasından alan CUNDALİ BUTİK OTEL siz konuklarımıza deniz, doğa ve değirmen manzaralı sessiz, huzurlu, rahat bir aile otamında kendinizi evinizde hissettiren bir tatil sunar.Cunda'nın denize girilen tarafında yani kalbinde yer alan konuk evimiz Rahmi Koç Oyumcak Müzesine, Taksiyarhis Kilisesine, Restaurantlara ve plaja yürüme mesafesinde olan otelimizin Ücretsiz otoparkı vardır.